Gastronomy (by a Wanna-Be Chef): Holy Bellini! In today's world, creative marketing is a must for selling one's wares. With the economy in the state it's in, now more than ever anyone in sales needs to do different things. It's time for new, fresh ideas that get the us consumers excited. That's what gets us to come back. Everyone's money is particularly precious, so if you want us to spend it, it better be worth it. As you may already know, I am a fan of the Thirsty Fellow. The Vivver and I went there today with my parents for lunch. Since I'm addicted to the Philly, I don't have to spend much time reading the menu. This is good you see, because I am otherwise engaged with the wunderkind when we're in a restaurant (what do you want to order? are you sure? put your feet down. sit on your fanny. no playing with the knives.) So, today, I missed the fine print that my mom so deftly picked up on...$5 bellinis. Sounds pretty reasonable, right? It is. But, it's even better than that. The fine print that I missed spelled out that this $5 bellini also includes a REFILL. What? A grown-up drink with a refill? This is like the 1970's Golden Age of Happy Hours; two for one drinks. 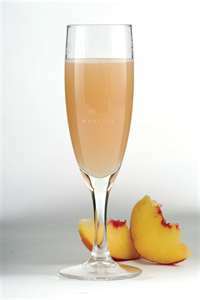 Or, you can look at this way...it's really a $2.50 bellini with a two-drink minimum! Either way, I've never seen a restaurant or bar use this tactic. I think it's fantastic! It's new. It's fresh. It's different. And this consumer finds that exciting. Even if I weren't addicted to that incredibly delicious sandwich, I'd be going back happily. This creative marketing is successful. And what's another name for unsuccessful marketing? Spitting in the wind. Cheers to you Thirsty Fellow...whoever you are.